Honda Car India bringing in a revolution called Connected Cars in India which is a one-of-a-kind information platform that seamlesslessly connects you to your car, your familly and Honda. Honda Connect is an exciting information platform with 20 features which runs round-the-clock which provides a sense of safety, security and convenience. Honda Connected Car feature is enabled on the Honda connect application which can be downloaded via Apple Store or Andriod Playstore on your respective devices once the installation of the ‘Connected Device’ is done on your car. Connected Device is provided by Minda i Connect Pvt Ltd and its available only at authorized Honda Dealers. The introductory price of initial 20,000 units of connected devices priced at Rs. 2,999/- which comes with 1 month free subscription. Check out the safety & Security and Convenience features of Honda Connect app here . And how the device and app can be used in real life scenarios in some examples shown in below video. The App is very simplistic and user friendly without much complications to the end users in understanding, it has clear and crisp design. The menu is easily accessible and an user can browse through and understand different options without much complication. The application works as expected and demo’ed in the videos of Honda Car India. We took a drive from City center and drove around the city to check out the different features of the app and also we ended up on the highways too to reach the Honda Dealer located on International Airport Road in Bangalore where we saw the live demo of the application where we practically saw how a customer care call came to one of the connected cars owner when there was some defect in his car. 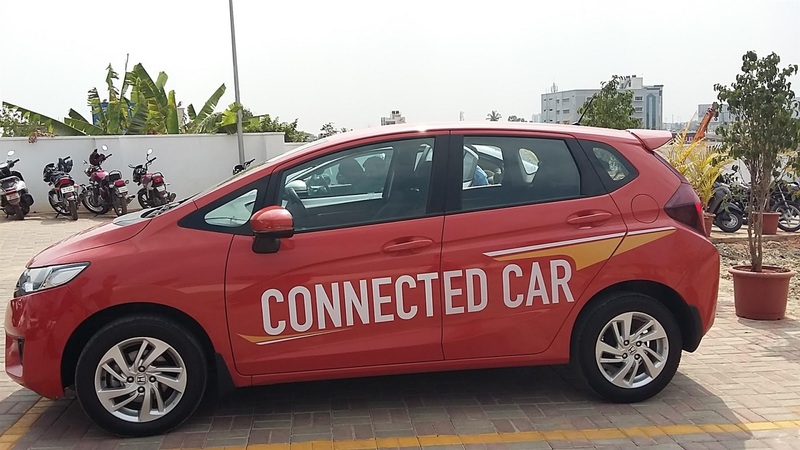 For the demo purposes, honda engineers had created a defect on a connected car and within 2 to 3 minutes, a call came from Honda Customer Care asking about the problem on their car and on how they can help. This is really a good and must have device for the Car owners which helps in distress. Some of the features which I liked most is the locating the pit stops around you and locating the dealers in real time wherever you are using the location. The app even allows to open the dealer’s location directly from the app and helps you navigating to the place using google maps. Using the app, one can share their trips to their loved ones so that they can keep track of the location of the car and the location which gives a peace of mind. There is another good thing about the app and a proof on how much Honda cares is the Honda Connect Feedback Survey which shows they are open for suggestions and feedbacks and how to improvise on them. Honda connect app covers all the aspects for a car owner and they can easily rely on the same when in trouble with their car and don’t have to keep remembering the things like their car service history and the travel details. Also, holding their documents in private cloud which can be accessed any time any where makes your life easy too. Overall, we totally liked the application features and the way it work in sync with your car. However, you can check out the FAQ’s here before you give it a try.